Moussa Dembele believes his hat-trick against Rangers in September was the turning point in his Celtic career. The Frenchman had been vying with Leigh Griffiths for a starting place, but his Old Firm treble helped set him apart. 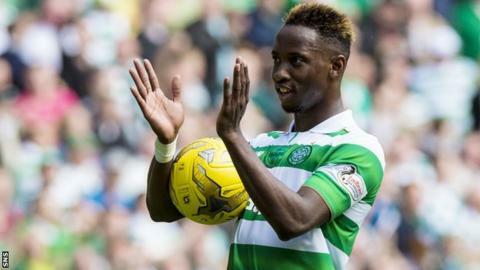 "It was a big moment in my Celtic career, my first hat-trick as a professional footballer and my first league goals for Celtic," Dembele said. "It was a good day to remember, but it's gone now and we have another [Old Firm] game on Sunday." Dembele has now scored 32 goals in all competitions for top-flight leaders Celtic - including 17 in the league - and he received the Premiership player of the month award for February after scoring six goals in three league games. The 20-year-old believes he has improved as a player since joining last summer from Fulham to work with Celtic manager Brendan Rodgers, who describes the striker as a "big game player". "I love the atmosphere of big games, so I'm ready for that," Dembele said. "I've developed a lot. Since the first time I came here, I've learned a lot. It's been a good season for me so far, and the Celtic team. "I'm young, so I try to learn from everywhere, and every aspect of the game is important. It's all about opportunities. I tried to take mine when the gaffer gave me a chance to play. Since then. I've tried to give 100% in training, and on the pitch." Dembele has four under-21 caps, as well as four goals, and a French television station named him the France Under-21 player of the year in 2016, ahead of the likes of Manchester United forward Anthony Martial and Borussia Dortmund midfielder Ousmane Dembele. The striker believes he is now on the verge of a full international call-up, with France naming their squad next week for the World Cup qualifying tie later this month against Luxembourg. "I would say I'm not far from [the full French squad], I just try to keep working and it will come when it comes," Dembele added. "I don't think about it. There's a game on Sunday and the French list is coming out next week and we'll see after that. "People in France know what I'm capable of, so it's not just about this game, it's about what I've done through the season."